Gluten-free diet fad: Are celiac disease rates actually rising? (CBS/AP) Nearly two million Americans have celiac disease and should avoid eating gluten, a new study finds. However, as little as a decade ago, virtually no one in the U.S. seemed to have a problem eating the protein that's found in bread and other foods. Miley Cyrus touts gluten-free diet: What do doctors say? Does the national uptick in people eating gluten-free foods suggest a celiac disease epidemic or are people unnecessary turning to the diets as a food fad? According to a new study from the Mayo Clinic, it may be both. It found most people with celiac disease might not be aware they have the condition, and many people eating gluten-free diets have never been diagnosed with celiac disease. For the study, Dr. Joseph Murray, a gastroenterologist at the Mayo Clinic in Rochester, Minn., and his team looked at blood samples taken from Americans in the 1950s and compared them with samples taken from people today and determined it wasn't just better diagnosis driving up the numbers. Celiac disease actually was increasing. Indeed, the research confirms estimates that about 1 percent of U.S. adults have it today, making it four times more common now than it was 50 years ago. That translates to about 1.8 million Americans with celiac disease, but about 1.4 million people with the condition may not be aware they even have it. On the flip side, about 1.6 million people in the U.S. are on a gluten-free diet even though they haven't been diagnosed with celiac disease. Celiac disease is a condition that damages the lining of the small intestine when a person eats gluten found in wheat, barley, rye or some oats, preventing the intestine from absorbing necessary nutrients. A strict gluten-free diet is often prescribed for people with the disease. Fads aside, the new study suggests more people are truly getting sick from the gluten found in wheat, rye and barley, but the reasons aren't clear. In the most serious cases, gluten triggers celiac disease, which can cause symptoms including abdominal pain, bloating and intermittent diarrhea. The lack of nutrients can cause sufferers to experience weight loss, fatigue, rashes and other problems. Celiac disease is different from an allergy to wheat, which affects a much smaller number of people, mostly children who outgrow it. It was once considered extremely rare in the U.S. But about 20 years ago, a few scientists began exploring why celiac disease was less common here than in Europe and other countries. They concluded that it wasn't less common here; it was just under-diagnosed. Scientists suggest that there may be more celiac disease today because people eat more processed wheat products like pastas and baked goods than in decades past, and those items use types of wheat that have a higher gluten content. Gluten helps dough rise and gives baked goods structure and texture. Or it could be due to changes made to wheat, Murray said. In the 1950s, scientists began cross-breeding wheat to make hardier, shorter and better-growing plants. It was the basis of the Green Revolution that boosted wheat harvests worldwide. Norman Borlaug, the U.S. plant scientist behind many of the innovations, won the Nobel Peace Prize for his work. But the gluten in wheat may have somehow become even more troublesome for many people, Murray said. That also may have contributed to what is now called "gluten sensitivity." Doctors recently developed an ambiguous definition for gluten sensitivity. It's a label for people who suffer bloating and other celiac symptoms and seem to be helped by avoiding gluten, but don't actually have celiac disease. Celiac disease is diagnosed with blood testing, genetic testing, or biopsies of the small intestine. The case for gluten sensitivity was bolstered last year by a very small but often-cited Australian study. Volunteers who had symptoms were put on a gluten-free diet or a regular diet for six weeks, and they weren't told which one. Those who didn't eat gluten had fewer problems with bloating, tiredness and irregular bowel movements. Clearly, "there are patients who are gluten-sensitive," said Dr. Sheila Crowe, a San Diego-based physician on the board of the American Gastroenterological Association. What is hotly debated is how many people have the problem, she added. It's impossible to know "because the definition is nebulous," she said. One of the most widely cited estimates comes from Dr. Alessio Fasano, a University of Maryland researcher who led studies that changed the understanding of how common celiac disease is in the U.S. Fasano believes 6 percent of U.S. adults have gluten sensitivity. But that's based on a review of patients at his clinic - hardly a representative sample of the general public.Other estimates vary widely, he said. "There's a tremendous amount of confusion out there," Fasano said. Americans will spend an estimated $7 billion this year on foods labeled gluten-free, according to the market research firm Mintel. But the best estimates are that more than half the consumers buying these products - perhaps way more than half - don't have any clear-cut reaction to gluten. They buy gluten-free because they think it will help them lose weight, because they seem to feel better or because they mistakenly believe they are sensitive to gluten. 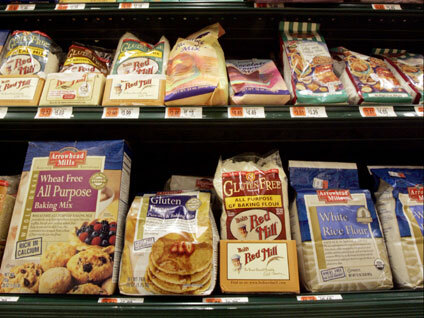 "We have a lot of self-diagnosing going on out there," said Melissa Abbott, who tracks the gluten-free market for the Hartman Group, a Seattle-area market research organization. But, gluten-free diets may not lead to weight loss. In fact, for celiac patients weight gain for those on the gluten-free diets is the goal because it suggests they're absorbing the necessary foods and nutrients they had been lacking. Whatever the reason, marketing of foods without gluten has exploded. Those with celiac disease, of course, are grateful. Until only a few years ago, it was difficult to find grocery and dining options. "It's a matter of keeping people safe," said Michelle Kelly, an Atlanta-area woman who started a gluten-free, dairy-free, soy-free, nut-free bakery in 2010 after her son was diagnosed with celiac disease. While conventional bakers use wheat flour, she uses such ingredients as millet flour, sorghum flour, brown rice flour and tapioca starch. At one of Atlanta's largest and busiest health food stores, Return to Eden, manager Troy DeGroff said over a third of his customers come in for gluten-free products for themselves or their family. "Thank you, Elisabeth Hasselbeck," he said, referring to one of the hosts of the daytime talk show "The View" who helped popularize gluten-free eating. It's hard to say how many of his customers have a medical reason for skipping gluten. But he said, "they're at least paying attention to what they're sticking in their mouth." The study is published in the July 31 issue of the American Journal of Gastroenterology.